So recently I've had a few people comment about my blog photos. Photography is such an important part of my aesthetic and something that I take a lot of pride in. Prior to starting my blog I did GCSE and A Level art (got an A* not that I'm bragging ;) ) so I've got a few years experience when it comes to knowing what looks good. However saying that, photography was never a massive part of my projects so I'm not sure how much good it really did me. In terms of equipment I'm so thankful that I have an actual camera to work with. IPhone cameras are great for Instagram etc but when it comes to high res, perfectly lit imagery; nothing beats the good old DSLR. Of course for those working on a budget, investing in a camera may not be an option and one day I think I'll do a post all about how I edit my Instagram. Specifically I own a Canon 1100D DSLR which I've had for about three years now. For the majority of that time I stuck with the basic 18 - 55mm lens however for christmas I was lucky enough to receive a 50mm f 1.8 which is absolutely perfect for portraiture. Here I just wanted to make a quick point about iPhone photos. Above you can see that the image taken (with my phone as the camera was in the shot!) is a little blurry, a touch pixelated and even with editing doesn't look as good as my usual work. This definitely proves that if you have the right equipment, the photos are so much easier to take! This is my original 18 - 55mm lens. I love the zoom on this as it's perfect for multipurpose shots. Close up of a lipstick? Got it. Far away shot of some buildings? Perfect. The only think I've found hard about this lens was getting photos of people right. It doesn't blur out the background and if you've got a shaky hand (Sophie I'm looking at you!) it makes getting great photos nearly impossible. However in general I still love this lens so much and will continue to use it for anything other than portraiture. Above is the newest lens to the collection: my beloved 50mm f 1.8 by Canon. If you're looking to get into portraiture more (as I am) and are swooning over the perfect blurred backgrounds that bloggers seem to faultlessly achieve then you've come to the right place. Whilst lens' are expensive (this one was about £100) there are much higher prices out on the market and I would happily part with my money for this one. It's a little less versatile than my other lens though nonetheless I wouldn't be seen without it! I have too main editing platforms that I'm obsessed with: my built in MacBook editor and PicMonkey. 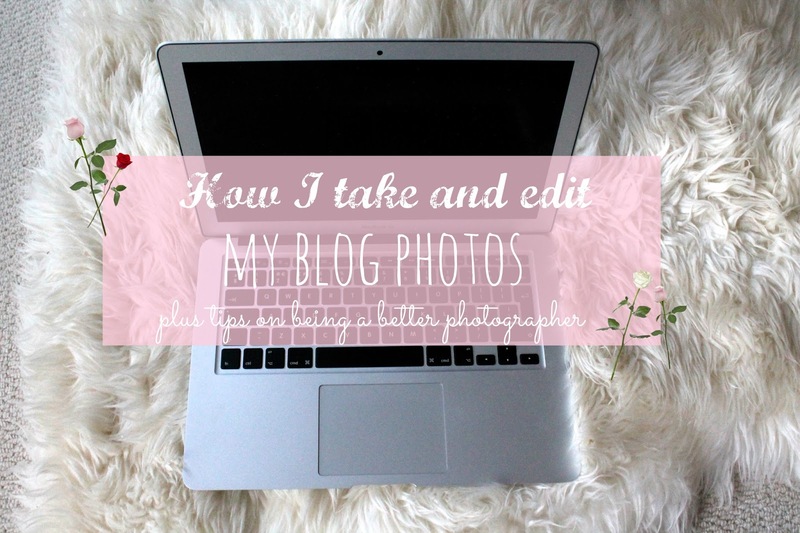 When I first started blogging I didn't edit my photos and my gosh you could tell! I wasn't prepared to invest in Photoshop (I'm still not to be honest) and didn't really know where else to look. However around the same time I switched from a PC to a Mac I discovered PicMonkey. It's free, it's got tons of editing options from adding text, to overlays, to generally touching up a photo. If you're wondering what I use to make the jazzy title photos then that's it! In terms of my Mac I don't do a huge amount to edit my photos. I always work in nature lighting so I mainly just up the exposure a tad, and increase the saturation and contrast a little. And I mean a little. You don't want your photos to end up looking like neon collages. 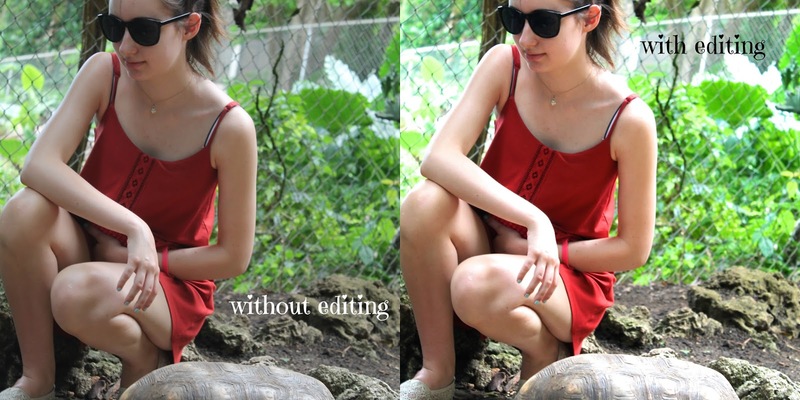 The photo on the left (the original) was taken in Barbados at pretty much midday. However as we were in a sort-of rainforest the shade was causing the light to be blocked out. All I've done is increase the exposure, added a touch more saturation to brighten the hues and maybe a little contrast to darken the shadows. And that's it! Hope you guys liked this post and I'll be back soon! Hi, thanks for sharing. Good camera. With this you can work. Photo after editing looks not very good. What software did you use? I use it https://macphun.com/intensify, this is my key to success. I advise you to try. Try to edit in other editors. Good luck. A Little Winter Fur - OOTD. Why Everyone Needs a Signature Winter Coat.